Wind is the world's fastest growing energy source with sustained worldwide growth rates in excess of 11% annually. By the end of 2017, world-wide wind-generated capacity was over 539,000 megawatts (MW). Canada continued its strong growth and in 2017 added 10 new projects totaling 341 MW and now has 12,239 MW (as of December 2017) of installed capacity supplying 6% of Canada’s demand for over 3 million homes, and the Canadian market is growing as fast or faster as the global market. According to the Global Wind Energy Council, (GWEC), Canada is ranked 9th overall in installed wind generating capacity. According to the Canadian Wind Energy Association (CanWEA), we have about 50,000 MW of developable wind resource-enough to supply about 20% of Canada's electricity supply. Improvements in technology have lowered the cost of wind generated power, so that today, wind power can compete with traditional sources of generation. Manitoba has a world-class wind resource and is well positioned to be a leader in this emerging energy. With the commissioning of the 138 MW St. Joseph Wind Farm and the 16.5 MW expansion of the St. Leon Wind Farm to 120.45 MW Manitoba has over 258 MW of installed capacity. Canada's massive hydroelectric resource, which provides 60% of Canada's electricity, is an excellent complement for wind energy and provides an excellent opportunity to integrate more wind energy into the system. In Manitoba, 98% of our generation capacity is hydro - electric. Because wind is intermittent, it must be firmed and shaped so it can be supplied to customers when they need it. Manitoba Hydro has good firming and shaping capabilities. When the wind is blowing, water can be stored in reservoirs. When the wind is calm, water is released to generate power at the dam site ensuring that customers get firm power on demand. 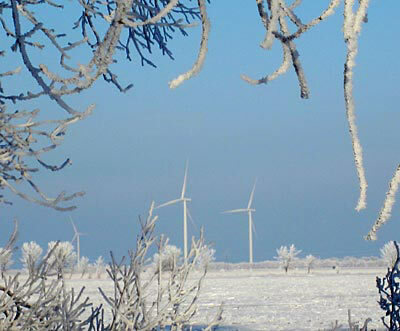 In addition, our wind regime is most productive in the winter months when our peak demand for power occurs. In Canada, Manitoba has very good access to transmission lines so we can move the energy effectively and we have an enthusiastic rural population that embraces wind development. So, overall Manitoba is well positioned to become a leader in wind generation. 12th floor, 155 Carlton St.